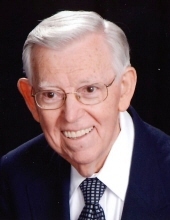 Albert “Leon” Morris, 89, of Cedartown, Georgia, passed away March 1, 2019 at Redmond Regional Medical Center. He was born on November 9, 1929 in Eton, Georgia. He attended Dawnville High School and Berry College, graduating in 1949 with an Industrial Arts Degree. While at Berry, he met the love of his life, his wife of 68 years, Gilda Thompson Morris. He was always known and loved for his dry sense of humor and compassionate and loving nature. Leon was preceded in death by his parents, Jud Lester and Maude May Swilling Morris, sister, Carolyn Morris Hayes, and son, Mark Leon Morris. He is survived by his adoring wife, Gilda Morris and his devoted daughter, Melissa Morris Cain (Bob), of Cartersville, Georgia. His grandchildren include Megan Morris Respert (Jason), Kaley Morris Blankinship(Matthew), Taylor Britt Gilmer, and Annelise Grace Gilmer. His great grandchildren include Carter Sharrow and Gunner Hatch. Leon worked for Bennett Construction in Rome before working with Rome Plow for 32 years. Leon was also very involved in his community. He worked with the Cedartown Little League for many years. He was the former president of the Lion’s Club, collecting eyeglasses to assist those in need. Since 1952, he was a member of the First United Methodist Church in Cedartown, Georgia. He held many positions, including teacher for the Keith Loveless Sunday School Class for 38 years. He was the last original member of that class. The celebration of Leon’s life will be held on Sunday, March 10, 2019 at the First United Methodist Church at 4 PM, with the visitation from 2 to 4 PM. Internment will be following the service at Polk Memory Gardens. Rev. Mike Broome will be officiating, with Mike McRae and Megan Respert delivering eulogies. Pallbearers include Bob Cain, Jason Respert, Carter Sharrow, Mike Taff, Mike McRae, and Scotty Tillery. Honorary pallbearers include Leon’s nephews, Bill and Phil Hayes, Preston Camp Sr., Dave Brown, Bill Ellis, William Woods, Allen Hunt, Gary Martin, Robert Gardner, Robbie Gardner, Harold Wyatt Sr., and members of the current Keith Loveless Sunday School Class. Flowers will be accepted. Memorial donations can be made to either the Georgia Lion’s Lighthouse Foundation, 5582 Peachtree Rd, Chamblee, Georgia 30341 or First United Methodist Church, 201 Wissahickon Ave, Cedartown, Georgia 30125. The Smith & Miller Funeral Home of Cedartown is honored to serve the family of Mr. Albert “ Leon”Morris. To send flowers or a remembrance gift to the family of Albert Leon Morris, please visit our Tribute Store. "Email Address" would like to share the life celebration of Albert Leon Morris. Click on the "link" to go to share a favorite memory or leave a condolence message for the family.